Recently, I had a reaction to a new restaurant at Walt Disney World that I can not remember having had before. As this blog has (voluminously) shown, I feel no particular need to like everything Disney does. I think most of the changes they make to their properties fall somewhere in the middle of my range of expectations, and only ever so often does something truly bad - or truly good - get put out. Last year, I wrote a lot about Disney Springs, and I still stand by that piece - I like it plenty. I've been there more often that I ever visited Downtown Disney near the end of its run, and as a local I'm not bothered much by the fact that its buildings aren't slapped head to toe with Donald Duck. But I was pretty deflated when Fulton's Crab House returned from its huge remake as Paddlefish. 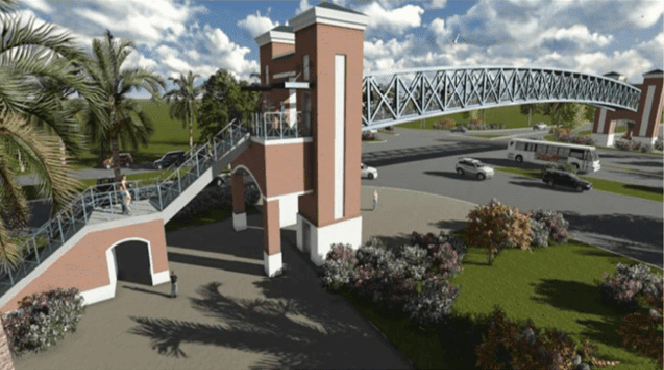 Over the summer I had already prepared myself for the worst - crossing the bridge across Village Lagoon, I could see that the interior had been gutted down to a steel skeleton. That had really taken the wind out of me - it was hard to see what I still thought of as the Empress Lilly more or less demolished. Yet as it was slowly rebuilt with a recognizable shape, colors, and even a brand new (immobile) paddle, my hopes rebounded. Yet when it finally opened and I saw the first interior images, I could not escape my gut reaction: "That's not very Disney." Like a lot of gut reactions, this struck me as immediately absurd but difficult to escape. A tour of the facility later reassured me that there was still some charm left in it, but my mind kept nagging away at the conversion: given one of the most impressive things at Walt Disney World, they did this to it? But was the Empress Lilly ever "Disney" not begin with? Why would I argue that the bizarre modernist / Southwest pastiche Contemporary Resort is classically Disney, despite hardly having anything "Disney" in it for much of its history? What makes something "Disney", anyway? Let's be clear, the question was raised by Walt Disney to begin with. He's sort of both the rule and the exception, because pretty much anything he did was by default "A Walt Disney Production". But besides things like Orphan's Benefit and The Wise Little Hen, Walt produced an eclectic batch of films. There's the difficult to categorize wartime films like Education for Death and Victory Thru Airpower, and the manifestly adult, sensual pleasures of Three Caballeros. Many of the Silly Symphonies seem fairly infantile, but The Old Mill and the first segment of Fantasia are practically experimental films. 20,000 Leagues Under the Sea is a sci-fi potboiler that ends with a nuclear explosion. Even Disneyland is wildly eclectic - if there weren't a huge Mickey Mouse face at the front gate, how many in 1955 would have doubted there would be anything especially Disney inside that landscaped berm? 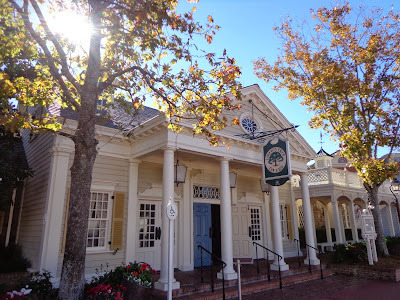 Walt Disney's lieutenants continued their leader's eclecticism, building a golf retreat, a campground, a few dinner theater shows, and finally a shopping complex. From our modern vantage point - looking back from a time when we're drowning in cheap 2017 t-shirts crowded with the same five Disney characters - this seems to be a golden era when Disney built really risky, unique things. 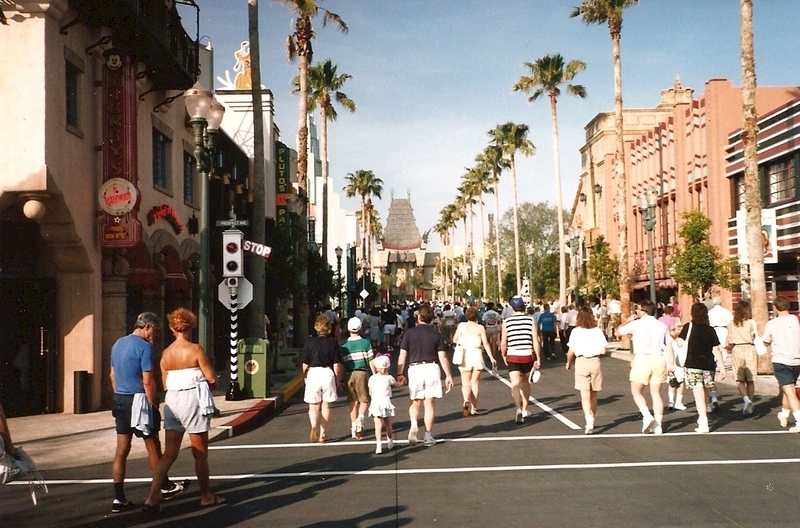 Throughout the development of Lake Buena Vista, Walt Disney Productions was adamant that it be a totally unique entity from Walt Disney World - so much so that they did not even build a road that connected Magic Kingdom to it. You had to drive back down World Drive to I-4, then drive up 4 to 535 and enter Lake Buena Vista that way. Disney billed it as "Host Community to Walt Disney World", which probably didn't mean much more to random visitors than it would today. What media coverage Lake Buena Vista got in 1975 was overwhelmingly local and fairly positive, especially following the energy crisis and national recession. In the 1975 Annual Report, Disney trumpeted attendance gains at the Magic Kingdom, while more modestly reporting the opening of the Shopping Village has "helped grow attendance". If actions speak louder than words, then here's one that shouts: within a year, a program to refurbish the Village had begun. 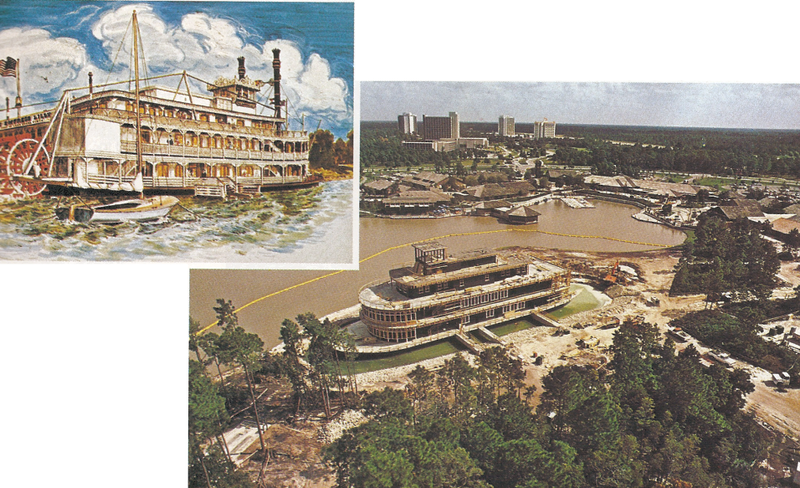 In 1977, the Empress Lilly debuted, and with it came a name change for the whole complex: the Walt Disney World Village. It isn't hard to guess at the reasons. The Village was built in a totally contemporary style, but 1977 renovations added fantasy elements - not just the Lilly with her endlessly churning paddle wheel, but Mediterranean statuary and shops with more whimsical names and decor, like "It's A Small World After All". The name itself points to a direction the Village was pushing towards throughout the 80s: more Disney, more fantasy. 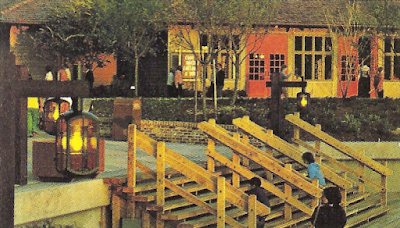 While the 1977 Annual Report stayed mum on the changes, in 1978 Disney noted: "The record year in Florida was reflected in substantially improved operations for Walt Disney World Village at Lake Buena Vista. 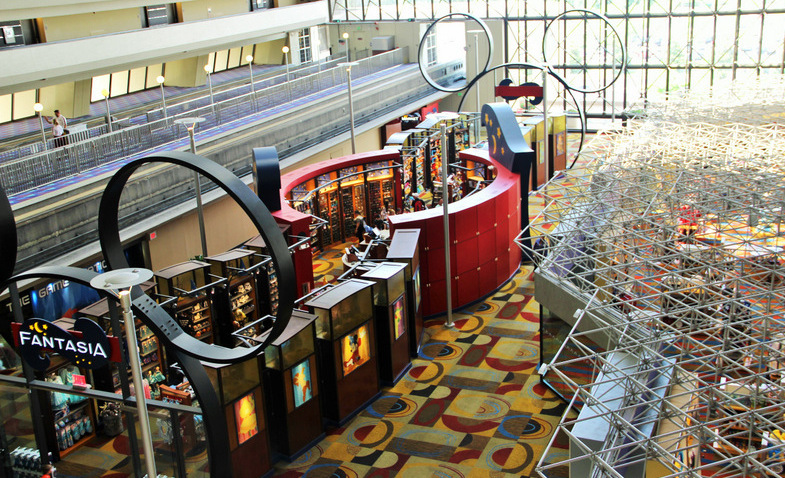 The improved picture is also being impacted by our continued efforts to expand the entertainment opportunities available to our Lake Buena Vista guests and visitors." In other words, it didn't work, and needed improvement. The Walt Disney World name - a brand WDP was so eager to divorce from their shopping village in 1975 - was needed to convince visitors that this new attraction had something to offer. Arguably, it's kept working ever since then - the Village grew into Downtown Disney, a concept which has opened in every Disney resort complex in the world. But if everything that has happened before will happen again, then all of this is familiar. And while I've written a lot about the aesthetics, convoluted backstory, and infrastructure upgrades of Disney Springs - the aspects this blog finds most compelling - as another prong in Disney's absurd steeplechase of the affluent, Disney Springs is yet another front. And while I've been the subject of angry rebuttals for my doubting the profitability of certain stores, the fact remains that, as a shopper myself, there's precious little there than I find compelling. I'm not alone. It isn't hard to find similar notes in the less regulated courts of public opinion on the internet - forums, Trip Advisor, Yelp - even in largely positive appraisals. 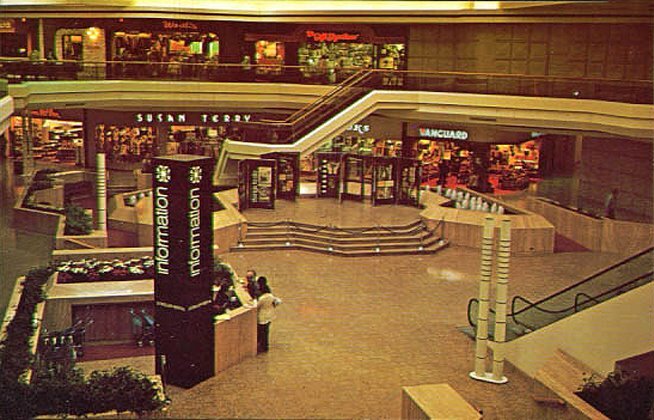 For me personally, it's enough to enjoy the architecture and urban planning, duck my head into a few shops, get a sushi roll and a cocktail, and leave. Those with who have traveled great distances and expect something more, those with small children, or those looking for bargains, seem especially flustered and intimidated by the size and grown up ambience of Disney Springs. But it's a delicate balance - one informed by decades of perception, expectation, and precedent. Before the opening of Disneyland, there was practically no association between Disney and fairy tale castles - There's one seen in the final shot of Snow White, and one that is a major setting of Cinderella. The logo of the entire company is today a fairy tale castle. There's even new product that seems to exist entirely to try and deliver more of the kind of imagery they are renowned for in the public consciousness - various live action remakes of fairy tales, the whole of The Princess and the Frog, multiple kingdoms in Frozen, etc. This same fairy tale overkill has been injecting the theme parks as of late too - a period in time I hope we will look back on "the castle wars". 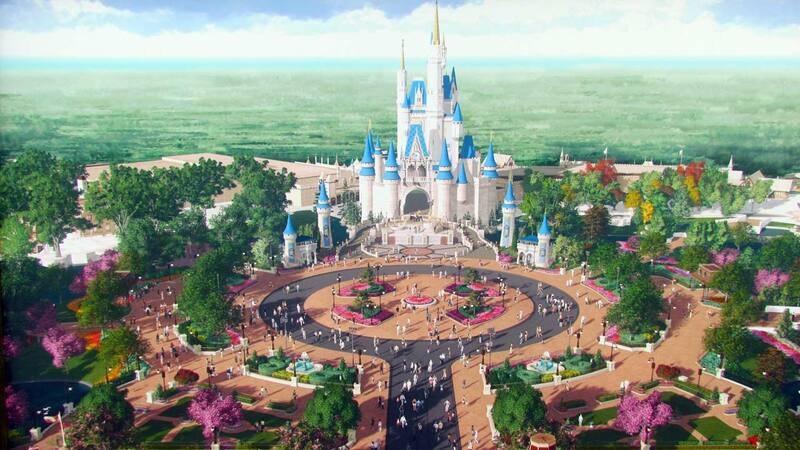 It began with Magic Kingdom's New Fantasyland, which added an entire addition to Cinderella Castle out back and two extra castles behind it, belonging to the Beast and Prince Eric. Then along came Shanghai Disneyland with their colossally proportioned castle with a boat ride underneath it. Magic Kingdom expanded their castle again in 2014 by adding new turrets on the hub, and now Hong Kong Disneyland is threatening to put a castle-hat on top of their existing castle because the Hong Kong government isn't about to let their Disney castle be so tiny compared to Shanghai's. "Now with 40% more castle!" The fact that castle iconography is sprouting up everywhere like mushrooms is not accidental, and will no doubt be welcomed by the types for whom Disney is nothing but animated fairy tales for children. Disney is bending over backwards to "make it Disney" for their paying customers. But a castle is just a castle - it only became a culturally loaded symbol once Walt Disney made one the icon of his hugely influential amusement park. Today it's impossible to separate the two - when Shrek wanted to make fun of Disney, it did it by introducing a fairy tale castle and a robotic doll show inside. It's nothing but a symbol - a flexible one, and one that can cut both ways. To the Grand Canyon Concourse in the Contemporary, an expensive resort Disney has trouble selling rooms in. If people don't like it, it must not be Disney enough, and what's more Disney than a colossal Mickey head? I can't think of a single situation where the "slap a Mickey on it" approach actually works, and so much of Walt Disney World has been allowed to fall behind the curve of fashion , that there's a lot of it now. But between the extremes of "not Disney enough" and "giant sheet metal ears", there has to be a middle ground, and it's a middle ground that Imagineering has been groping towards for the past 30 years. We live in a world of multinational corporations, and I write about one of them that is the economic steward of a number of works I admire. But I write this acknowledging that even defining what "Disney" is, is increasingly impossible. I'm an old school Disney fan, and so I believe that Disney is absolutely not Pixar, nor is it The Muppets. Or Star Wars and Indiana Jones, or Marvel, or Club Penguin, or any of the other hundreds of things that float around inside the Disney IP biosphere. But when I look at Liberty Square, or Frontierland, or even Disney Springs, I do see Disney. Why is that? Well for one thing, these are public places which are ostentatiously designed and which create insular universes. 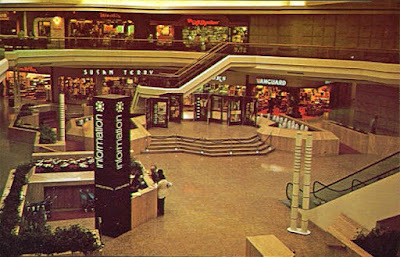 And while I may get my kicks at Disney, I'm promiscuous - I was a teenage mall rat, and I still enjoy going to a good mall because it scratches that same itch for some sort of engineered, controlled public universe. 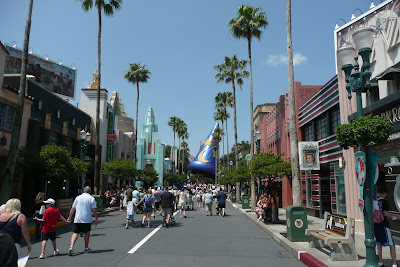 Neither am I a Disney snob - I also go to and enjoy other theme parks like Universal, and even regional amusement parks. I will go to and enjoy any place that gives me that same sense of harmony, of energy, of place. I drool over stuff like this about as often as Disney stuff. So we could say, on a basic level, that to make something "Disney", it needs urban planning, attention to detail, and a sense of harmony. That sense of harmony is crucial, and it's the reason why a normal mini golf course doesn't come off as Disney but a high-end mall does. It's the reason why, prior to the Disney Springs conversion, thousands of guests daily milled around thru the Downtown Disney Marketplace, trying to avoid the rest of the complex - whether subconsciously or not. It's the toughest thing to get right, and it's the toughest thing to maintain - Universal Studios Hollywood and Florida has practically no harmonized public spaces at all, just a series of facilities in different aesthetic silos. Harmony is that X factor, the thing that the rest of life is missing, the thing that art tries to correct. It's the reason why Tomorrowland strikes everyone as a hodgepodge of random stuff - the various reboots of the area always come down to some new stuff placed on top of the existing original structures, so that there is a contrast between clean lines and futuristic bric-a-brac. Those clean lines underneath the new theming always speak louder than what's in front of it - there's a disconnect in meaning and form and that sense of harmony is disrupted. Consider Liberty Square - the diminishing perspective and solid symmetry of the Hall of Presidents creates the impression of stability and stateliness which reflects the theme of the show inside. At the Haunted Mansion, a similarly opulent and stately structure has gone crazily wrong, with weird spikes everywhere, an asymmetrical conservatory, and with both wings jutting towards the viewer menacingly - a totally different thematic statement than the Hall of Presidents. Then consider the Liberty Tree Tavern, with its three doors, wide veranda, white turned columns, and approachable scale - what a sense of hospitality it creates from the road. All of these structures have harmonized their theme and purpose into their designs, and harmonize with each other, to create that pleasant vibe. It's also the reason why "throw a Mickey on it" never, ever works. The mere appearance of Mickey does not guarantee charm, despite what Disney seems to think - the cutout Mickey heads all over the Transportation and Ticket Center aren't theming so much as the design equivalent of branding on cattle. They assert ownership in a way which is intended to be reassuring and welcoming, but comes off as a hollow. It's because the "Disney" accents on the TTC, or in the Grand Canyon Concourse, or even in many areas of Downtown Disney, are - like castles - just symbols. They speak a different design language than the rest of the area. 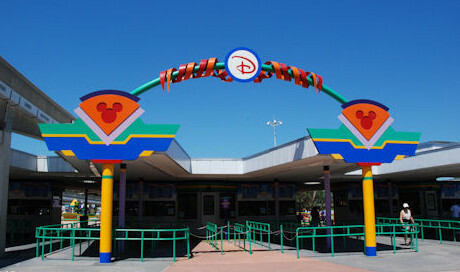 Whereas the area around it may be visually saying "This area is really impressive, and unified, with beautiful colors", the giant Mickey head always shouts: "Property of Disney!". 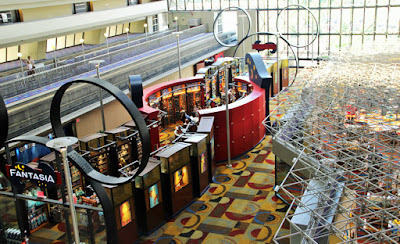 Making It Disney - also known just as proper theming - has multiple approaches, ranging from the hard sell to the soft touch. The hard sell is what you see on 192 in Orlando - giant oranges, wizards, and mermaids perched on nondescript buildings. They're "themed" in the loosest sense of the term - they've got a big fantastical doodad glued onto the front. Or there's the soft touch - the warm colors, white pillars, and shaded porch of the Emporium on Main Street invites you in even before you know it's a gigantic shop. The colors, kinetic activity, forced perspective illusion, and kinetic harmony of Hollywood Boulevard invites you down it, drawing you into the heart of the park, The palm trees are like landing beacons, inviting you to keep walking to find out what's at the end of the street. Or you could put a huge Mickey hat there. But as John Hench liked to say, good taste costs no more.